Shown with Distressed Pecan Wood Finish. Shown with Antique Black Wood Finish. 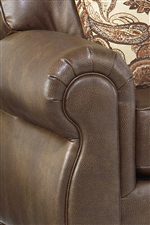 This stationary arm chair will infuse your home with traditional charm. Elegant bun wood turned feet and rolled arms create an elegant design. A padded seat cushion and soft back cushion provides a comfortable and inviting place to sit. Add this classic chair to your living room and pair with the sofa for a sophisticated room. 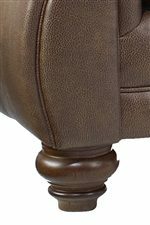 The Fitzpatrick Traditional Club Chair by Best Home Furnishings at Best Home Furnishings in the St. Louis, Chesterfield, St. Charles, MO & Waterloo, Belleville, Edwardsville, IL area. Product availability may vary. Contact us for the most current availability on this product. Arm Elegant rolled arms add traditional appeal. Seat Plump box cushion. Loose.